HAY-ON-WYE | WALES | JUNE 2017 | For many years, I kept a scrap of paper with the words Hay-on-Wye. I must have read about the Welsh book town, mentally put it on my want-to-visit-list, but kept a note in case I should forget. Last summer, I thought it was high time to put that scrap of paper into action. I flew to London and worked my way to Hay-on-Way by train and bus. Hay is a small town, I could tell from the way the bus driver smiled at me when I asked him if there was more than one bus stop. The place looked deserted and I remembered one of the guide books warning its readers about not to expect a heavy night life. The town would be dead in the evenings, all the tourists probably tucked up in their lodgings browsing through new books. A couple of young girls came to our rescue, they knew nothing about taxis, but pointed us in the right direction. It took us less that ten minutes to locate our B&B. 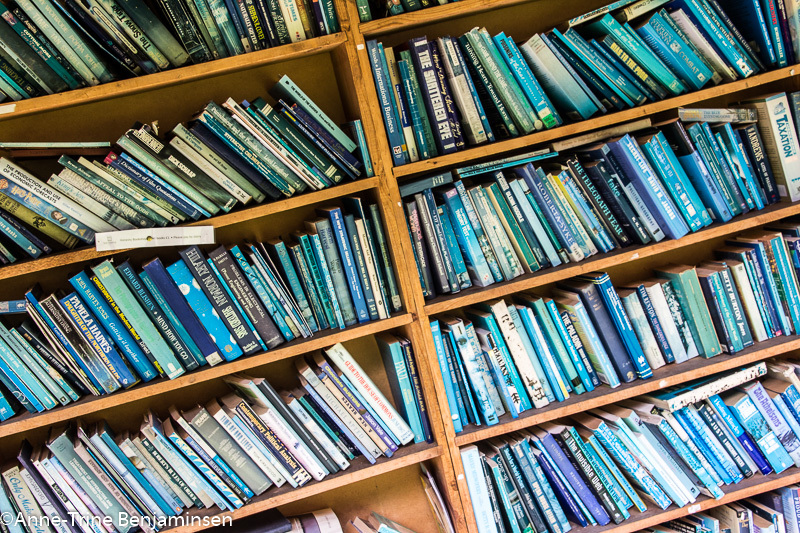 One bookseller sorted the books by colour, this is the blue section. Hay has loads of charm; the town is a little hilly – but you won’t exhaust yourself – and within an hour you have been just about everywhere. 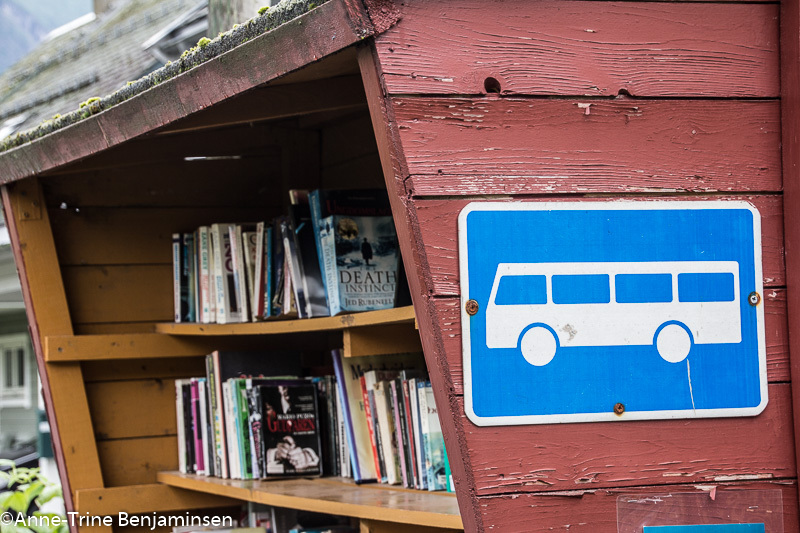 At present, there are some 30-ish booksellers scattered around the town, with over a million books for sale. There is a variety of shops selling new books, you’ll find second hand and antiquarian booksellers, as well as those specialising – like ‘Murder and Mayhem’ (the theme should be pretty obvious …) or ‘Rose’s Books’ selling rare and out of print children’s and Illustrated books. But the jewel in the crown is undoubtedly ‘Richard Booth’s Bookshop’, a beautifully restored building, the shop front is hard to miss. Booth’s is the cultural hub of Hay; in addition to three floors of new and second-hand books, the shop also hosts a café and a cinema. The atmosphere is one of a kind, the interior and sign-posting beautiful. Hay has a number of other small and interesting speciality shops and should you need a rest, food and drinks are within easy reach. Find yourself a nice café corner, preferably out of doors, and over a coffee you realise that you keep seeing the same people again and again. As I said, Hay is small. 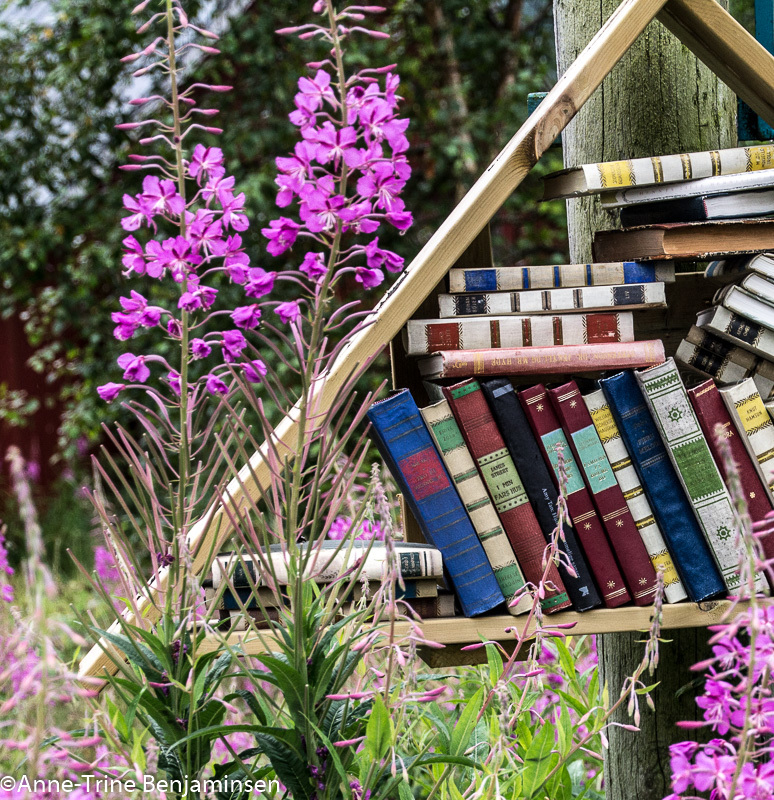 Hay hosts a famous literary festival every summer, but accommodation is hard to find. According to our hostess at the B&B, festival visitors keep booking ahead year after year (in surrounding villages and towns far afield as well), unless you have a tent or a camper van you might just forget about the festival. I spent three days in Hay and never tired. In between books and coffees, there are some beautiful river walks, and paths up on the moors are signposted although a little overgrown. Before you know it, you are touring among sheep, and more sheep! FJÆRLAND | NORWAY | JUNE 2017 | To be honest, Fjærland is nothing more than a stretch of road in the Norwegian fjord land. It must be said though that Fjærland hosts The Norwegian Glacier Museum which I should think attracts a fair share of tourists. But some of us visit only for the books! 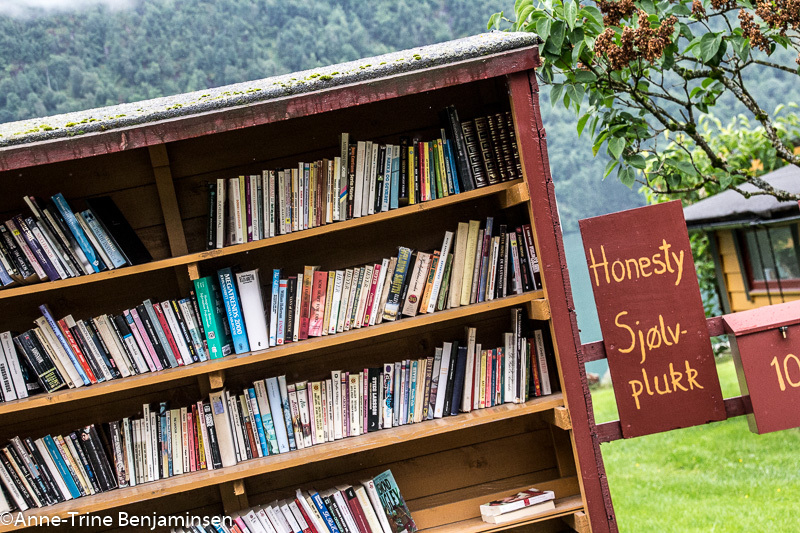 Contrary to Hay, Fjærland offers only second-hand books. 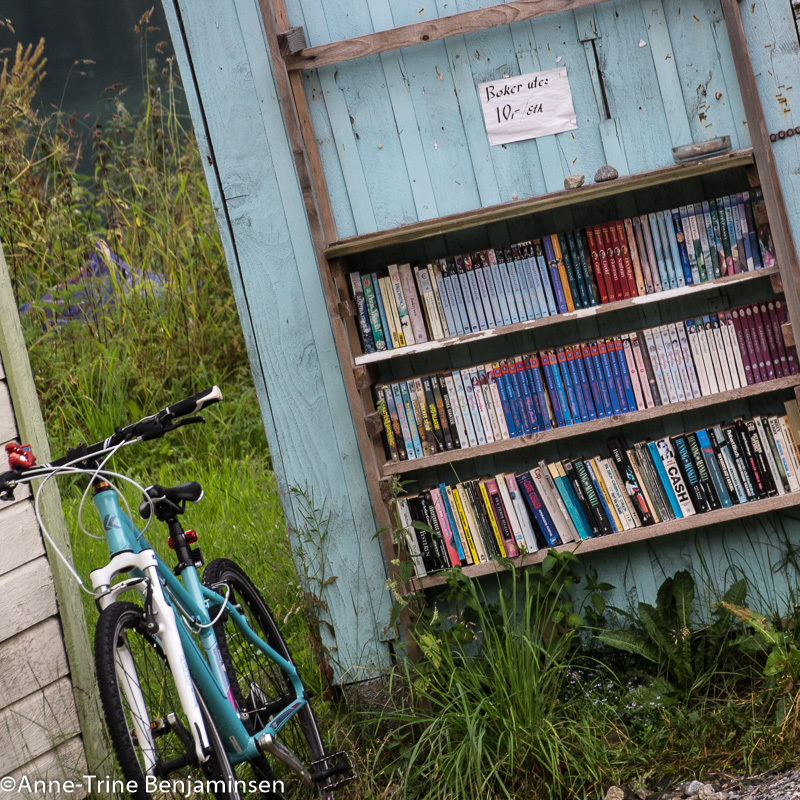 The many characteristic shops are mostly abandoned buildings and some of a creative kind; a bus stop shelter has become a self-service shop based on honesty, we visited old barns and quaint houses brimming with books, we spotted a book shelf in the midst of Willow Herbs. 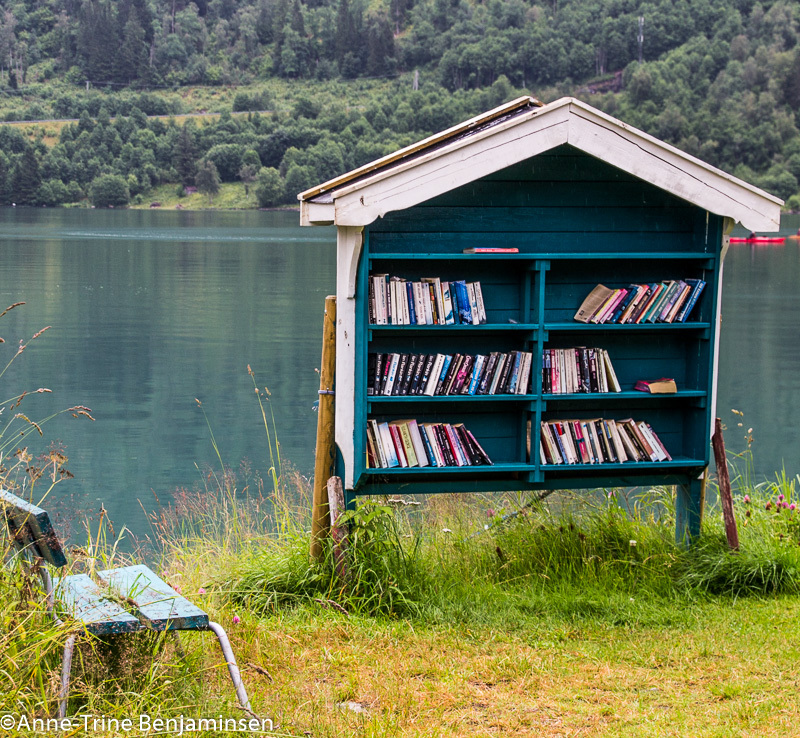 The blue shelf facing the fjord has aptly been equipped with a bench should you need more time to decide, or just admire the view. The perfect place for a coffee – and new books. 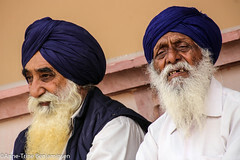 Mundal hotel. Would you rather prefer the indoors, you can sink down in old chairs and sofas with a pile of books and let time pass. Some of the booksellers are quite big with an impressive selection. Everything is neatly sorted, order prevails! The atmosphere in Fjærland is muted. There isn’t a rumbling cappuccino machine in sight. 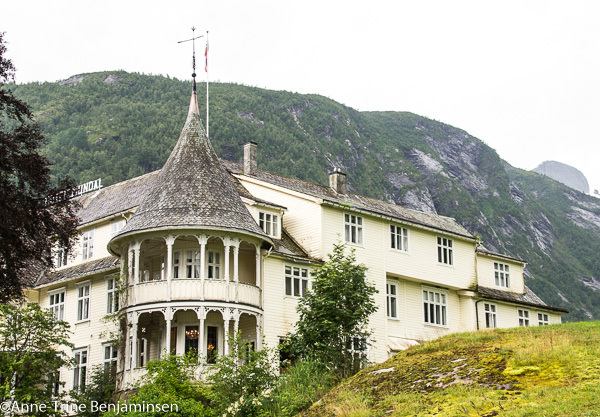 Or maybe just about one, in Fjærland’s one and only stately building; The Mundal Hotel. The café shouldn’t be missed and for two reasons; the beautiful interior and the yummy cakes! Hay-on-Wye and Fjærland is two of a kind, although both with a distinctive stamp. Hay is obviously more commercial than Fjærland, and bigger. Fjærland is quaint and the surroundings are very rustic. I wouldn’t miss any of them! 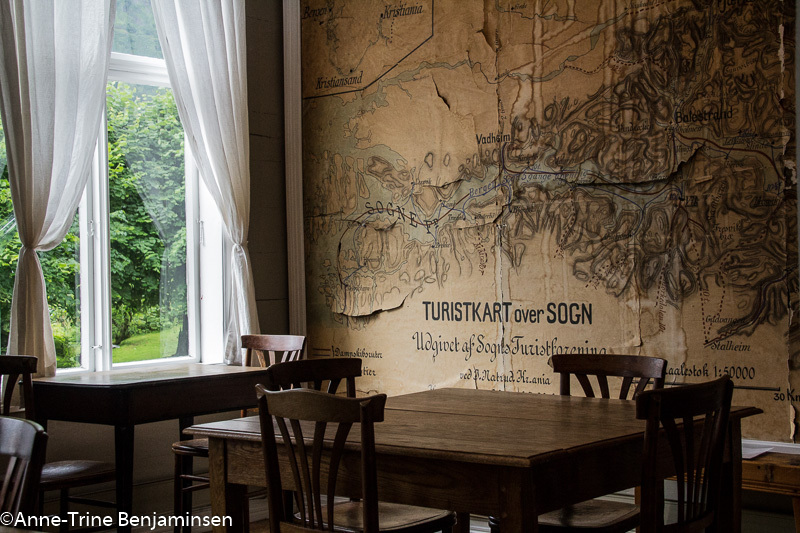 GLIMPSES from Fjærland – HAPPY TRAVELS! Mundal hotel has a look and a feel. Not among the less expensive though!